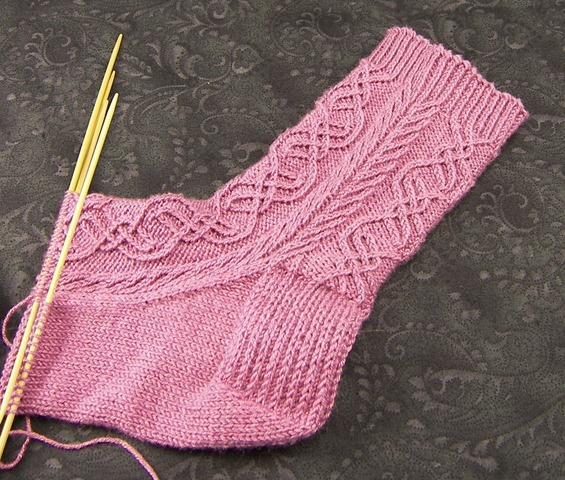 I love knitting and especially designing twisted stitch socks. Exhibit A: Danube, Salzburg, and Glass Slipper. I’ve finally completed my collection of German stitch dictionaries (if you haven’t seen, they’ve reprinted all three Überlieferte Strickmuster into one volume over at Schoolhouse press). Well, “completed” might be a bit strong- I’ve gotten enough that most traditional twisted cables are covered. I’d consider myself a twisted stitch fanatic. I know at least three ways to do the cable turns and I understand why twisted ribbing is stretchier than regular ribbing. How is it, then, that I’ve missed learning about this fabulous information until now? Something about these beautiful stitches has always bothered me. You can see it on the accent cables on Salzburg. One cable is very compressed and just looks likes close diagonal lines. The other cable has some space between the diagonals, allowing you to see the way the cable swirls. It happens with any of the twisted stitch cables. The ones that travel to the right always seem squished, not as defined. I’ve always wondered what caused that. And, of course, what I could do to fix it. (What can I say, I’m a huge perfectionist.) I started to think that this phenomenon was just a fact of knitting, like the curl of stockinette or the inelasticity of stranded projects. I’m very glad that I always read “Ask a Knitter” in the Ravelry newsletter. Usually I know the answers to most of the questions, but this time…! This issue is written about just this problem. Turns out that it’s the very twist of the stitch that causes this squishing, this lack of definition. 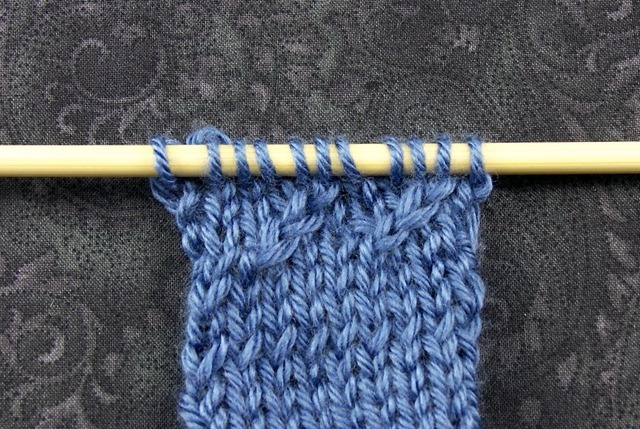 Knitting a stitch through the back loop causes the left side of the stitch to overlap the right. 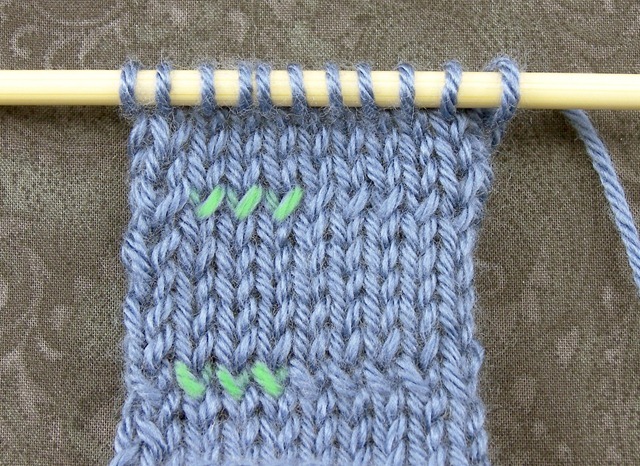 This is a left-twisted stitch. When a stitch like this travels to the left, it travels in the same direction as the twist. The stitch stays flat, even, and well-defined. But when a left-twisted stitch travels to the right, it kind of rolls onto its side. It’s traveling against the twist and the pull of the yarn makes the stitches appear narrow and squished. Think about looking at a book cover versus looking at the spine. 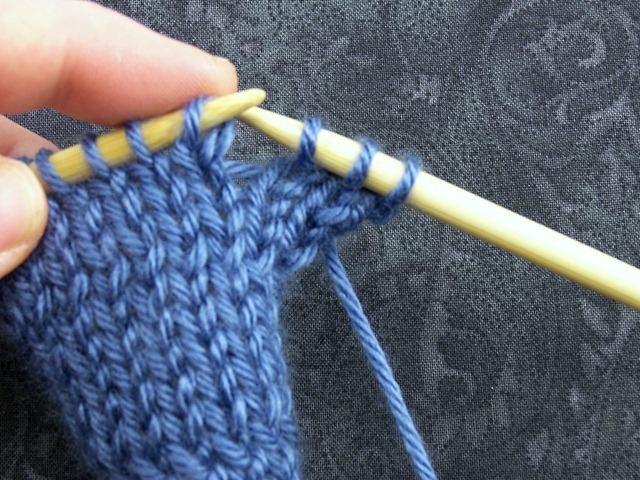 Then knit the stitch through the front leg, wrapping the yarn around the needle in the opposite direction of normal. The opposite wrapping will make the new stitch have the same Eastern mount so that you don’t have to remount the stitch on the next row/round. Ta da, a stitch with the right side overlapping the left! You might notice some similarity in the above picture to this tutorial of lifted increases. The principle is the same, creating directional stitches. It’s also the same as M1L and M1R. See, no turning on their sides! The stitches are flat and well defined. Now, not everyone is as big a dork-perfectionist as I am, and not everyone is going to want to micromanage their twisted stitch projects so much as to change stitch mount for every right-traveling stitch. But for those few of us who do, aren’t you glad to know about this? Go check out the Ask a Knitter column in the #67 issue of This Week in Ravelry for more! Thank you so much. I’m taking the pomatomus socks from Cookie A. and making them mirror images of each other. I’m obviously a glutton for punishment. I wasn’t sure if I should bother taking the ktbl and twist them the opposite way for the second sock, but now I’m sure I will. Thanks again.